Do You Know What Not To Feed Your Cat? » Do You Know What Not To Feed Your Cat? Do you ever give your cat a special treat? ​Picture this! You are sitting on the couch and kitty is looking longingly at your banana or you think kitty deserves a nice bowl of milk, after all, isn't milk good for kitties? Well, no but more about that in a minute. We love our kitties and we just want to share and give them a treat to make them happy but it is not always such a good idea. How do you know that those things that you find yummy are okay for a cat to eat? Their digestive system is nothing like ours. Well thank goodness for that. Kitty was crunching on a cockroach last night and well, I know it’s protein but I wouldn’t want to eat a cockroach so why would my food be okay for kitty? Those human treats may not be so special, in fact they could be potentially poisonous or harmful to your pet. Cats are pretty fussy about what they will eat as I'm sure you may have discovered when trying to add a crushed tablet to your cat’s food. It can be very well disguised but they still know it is there. This could be a good thing from kitty’s point of view because he won’t necessarily want what you are having. Can cats eat canned tuna? Can cats eat coconut oil? Can cats eat raw chicken or raw mince? We have grown up thinking that milk is good for cats but actually most cats are lactose intolerant so feeding cats milk and cream can cause gastrointestinal issues such as vomiting and diarrhea. Chocolate contains theobromine and caffeine which can lead to heart problems and muscle tremors or seizures.That’s okay, more chocolate for you, none for kitty. Don’t feed cats, dog food just as you wouldn’t feed a dog, cat food. It can cause nutritional deficiencies. Don't feed your cat grapes. Eating grapes and raisins can cause sudden kidney failure. The signs of toxicity are usually apparent in 24 hours and can include lethargy, loss of appetite, weakness and abdominal pain. Cooked bones can splinter and and cause choking and perforations of the gastrointestinal tract. It is okay for cats to eat raw bones but make sure they are fresh. Can cats eat raw fish? 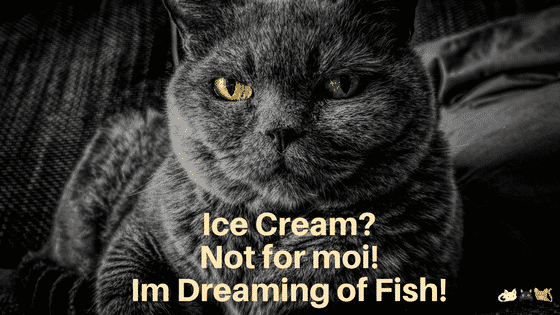 Yes cats do love raw fish but make sure the diet is not just raw fish or mostly raw fish. Raw fish is okay once or twice a week and that is because predominantly raw fish diets are often defect in thiamine due to the presence of enzymes that break down the thiamine. Cook the fish first. Lucky kitty. Excessive amount of liver is not a good idea as liver is high in vitamin A which can be toxic at high levels. Just give kitty small amount of liver. Onions can damage red blood cells and cause anemia. This includes cooked and raw onions. Moldy food including dairy products, bread, rice, fruits and nuts. This can cause mycotoxins which cause tremors, vomiting, rapid heart rate and breathing and in severe cases, convulsions (more common in dogs). Potato, rhubarb and tomato leaves and stems - contain poisonous alkaloid glycoalkaloid solanine, which cause can cause violent lower gastrointestinal problems. See more information in the FAQ’s regarding potato. Raw eggs can contain parasites which could lead to pancreatitis. Cooked eggs are fine but only in small amounts. That is a list of what not to feed your cat but what about food that seems harmless like some potato or banana. It pays to check first. The ASCA site outlines plants that are toxic or non toxic to cats. Cats can eat a small amount of cooked rice. It is not part of a balanced diet and shouldn’t be used long term but an occasional treat will be okay. Is kitty really going to want to eat lettuce? Once again, lettuce is non toxic to cats but it is not something we would ordinarily think of feeding cats who are primarily meat eaters. A small amount won’t hurt. Tomatoes for cats? Better to leave alone. Definitely not the leaves or stems of tomato plants. The tomato plant contains solanine which is toxic if eaten in large amounts but would cause gastrointestinal upset. The actual fruit of the tomato is okay but I have yet to see a cat that likes tomato.There’s always an exception and there’s probably some tomato loving cats out there. It’s okay sometimes but tinned tuna is made for humans not cats so there will be nutritional deficiencies if eaten too often. Cats can eat pasta on the odd occasion but pasta is carbohydrate and cats really don’t need much carbohydrate in their diets as their requirements are mainly protein. A cat's metabolism breaks down amino acids (protein) much faster than humans and so cats have much higher protein requirements. Honey can be difficult to digest for some people, particularly raw honey. It is not suitable for cats as cats are primarily carnivores and honey would have no place in their diet in the wild so no, don’t give your cat honey to eat. Save the bananas for yourself. Bananas are not toxic to cats however they are chock full of carbohydrates which are not good for cats. As they are primarily meat eaters, cats have adapted over time to tolerate a small amount of carbohydrate in the diet but have very little need for carbohydrates. If your kitty really wants some banana, a small piece will not hurt. Our cat turns his nose up at banana, it’s not on his menu at all. Although many adult cats are lactose intolerant, a small amount of yoghurt such as Greek yogurt is okay because it contains live cultures and natural bacteria. The active cultures help to break down the lactose during the fermentation process.This is also the reason that some people who are lactose intolerant can eat small amount of yoghurt. As with bananas, cats can tolerate a small amount but it is not something they need in the diet. The apple seeds however are poisonous as they contain cyanide which makes the seeds poisonous to other animals and humans, although obviously much larger quantities would be needed to be eaten to be poisonous for humans. The same applies to pears. The seeds contain cyanide but a small amount of the fruit will be okay for a cat. Any citrus fruit including oranges, lemons, limes, grapefruits and tangerines are not okay for your cat to eat. The oils in citrus fruit will cause gastro upsets and the acidity in citrus fruits is too much for a cat’s digestive system. As much as we love citrus scents, cats don't like citrus scents at all. Some people use orange rind or peel to keep cats out of the garden. You may have read my article about our cat attacking our new leather lounge and the lengths we had to go to stop this behavior. I am going to try using some orange peel along the top of the couch as I caught him up there again this morning. Celery leaf is okay for cats to eat in small amounts. Some cats react to celery as though it is catnip and our cat is one of those. It was a big surprise to us to see how he fell in love with the leaves from celery and rolled around on it and was just happiness personified. Coconut oil is a hot topic right now regarding human health and there is positive and negative debate as to its effectiveness. Rather than interpret this information relating to cats , this is a link to a veterinarian's advice regarding the use of coconut oil in caring for cats. If in doubt always consult your local vet. Bread is one of those things that is of no nutritional value to cat. Carbohydrates should play a small part in your cat’s diet so if he is licking some crumbs up from the floor that is fine or even a tiny piece of bread every now and then won’t hurt but remember it won’t help either. Yes cats can eat fresh pork, not bacon or ham which may potentially have all sorts of added preservatives. Fresh pork is a good source of protein for a cat and can be added to a cat’s diet along with other sources of raw meat protein such as beef chicken and lamb. Cheese is a milk product, and as most cats are lactose intolerant it is best to avoid giving cheese to your cat. It’s likely to cause a tummy upset and diarrhea for poor kitty. Kittens drink milk but once they're weaned their bodies top producing lactase which is needed to properly digest milk products. Some cats can tolerate lactose however it is still not advisable to give your kitty such a calorie laden food. Yes, along the same lines as can cats eat apples and pears and bananas. Blueberries in moderation, just a couple at a time are okay. It's pretty hard to overdose on blueberries but make sure kitty just has a couple as it is protein that should form the majority of the cat's diet. Cats are carnivores and need animal protein to meet their nutritional requirements. Cats can eat fresh raw meat. Choose human grade meat because often pet meat has added preservatives. When I am preparing a meal, I cut some meat for kitty and just put it aside until his dinner time. Cats should definitely not eat raw potato or potato peelings. The plant and greens skin of a potato contains solanine which is poisonous. Sweet potatoes are not labeled as toxic by ASPCA however they can cause other health problems and are best avoided. Cooked potato on the other hand is okay. The toxins are removed when cooking. So a little cooked potato is okay but be mindful of the amount of milk, butter, salt etc that you may have added to the mashed potato or other spices or flavourings in the boiled or baked potato. You wouldn’t want your cat to eat the avocado pit but then that would be pretty hard to do. Avocados can be dangerous to some animals such as horses and cows plus birds and other animals however it seems that cats and dogs are exempt from this list unless the fruit and branches are ingested in large quantities and then it can cause gastrointestinal problems. Avocado is found in measured doses in some commercially available cat food. Just because something is non toxic is not a reason to eat it. Peanut butter cups and cinnamon buns are not toxic to humans but that doesn't mean we can eat them as we please and not have any consequences such as health issues related to being overweight or lacking in essential vitamins and minerals to aim for a long and healthy life. It is the same for your cat. We have to give our cats the best chance health-wise by providing a good diet for them. If ever in doubt about whether or not your cat has eaten something poisonous contact the pet poison helpline. Previous Post Awesome Gifts For Cat Lovers – Ideas That Make It Easy To Choose Next Post Why Do Cats Headbutt You When You Get Home?